I have beef with beef. Not eating it, I should add, oh no, I love eating beef. But cooking it is something I apparently just cannot do. If I cook a steak it’s inevitably either a grim grey colour or practically raw ( I know for some this would be absolute heaven, but I’m a medium rare kinda girl and require at least some heat on my steak); cook a roast beef and it’s always tough and chewy. Beef and I, we can’t catch a break. I never have this problem with chicken, I’ve cooked it so much it’s become natural to me. I crave that kind of confidence with beef but it’s just not happening. It’s incredibly annoying that I can’t get to grips with one of the most delicious things you can eat. I’d love to say that this all changed upon cooking what I’m about to write about but sadly no, I’m still a dud when it comes to beef. I wanted to cook this dish a) because I said I’d stick to the Deep South theme for a little while so I should really stand by what I said, and b) because I wanted to cook up a little reminder of our New York holiday last year. I don’t feel I’ve done nearly enough annoying holiday reminiscing on this blog for my liking, and everyone likes hearing detailed information about other peoples travels right? Please, tell me again about the hilarious language mix up with the Greek bartender! Anyway, I’m going to tell you about Dinosaur Bar-Be-Que whether you like it or not. Barbeque food is as Southern as iced tea on a porch swing, yet very un-Southern New York is packed with restaurants dedicated to barbeque as well as soul food originating from the state of Louisiana. It’s no surprise really, New York is undoubtedly one of, if not the best place to eat in the world, you can find pretty much everything if you’re willing to look. 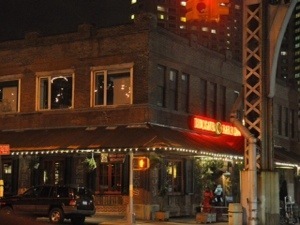 Dinosaur BBQ can be found in Harlem as well as a couple of other locations upstate. One was even featured in Man vs Food, so we knew we had to check the place out as a pilgrimage to the joys of greed. Before I tell you just how much we ate, I’d like to point out that we had done a ridiculous amount of walking that week and burned a hell of a lot of calories. Plus we were on holiday so hold your judgement! Ok, so first off we had a bucket of wings. They were incredible, you would be a complete mug to go there and not try them. We went for a combination of garlic chipotle and wango tango marinades and both were excellent choices. I’ve not had better wings before or since. It was perhaps inevitable that what followed felt slightly disappointing, the wings were a hard act to follow. We had a combo plate which included smothered ribs, beef brisket in BBQ sauce, pulled pork and several sides. While everything tasted really good, they didn’t quite have the wow factor of the wings and I think the expectation of having proper American BBQ food meant whatever came out would never have quite lived up to all the Man vs Food moments. Still, I learnt that I really like brisket in BBQ sauce and wanted to try and recreate it at home. Silly Hayles. If there’s one thing I should have learnt from all this blogging, it’s that trying to recreate holiday foods rarely, if ever, works. Banana cheesecake from the Cheesecake Factory is a case in point. Try things, enjoy them, move on, that should be my new mantra. I was lured into foolishly recreating beef brisket by the book USA written by Sheila Lukins. It’s a behemoth of a book with tons of recipes, which maybe should be a warning that the quality control on these recipes isn’t top notch. How can you test and ensure over 600 recipes work? I had to marinate a joint of beef brisket (a cut of beef from the breast of the cow which needs long, slow cooking) in a spice mix, leave it in the fridge overnight and then cook it in what the book calls a ‘mop’, aka a BBQ sauce. The most disappointing thing about this recipe is that so many tasty, strongly flavoured ingredients went into making it and yet it tasted so meh. You’ve got bacon, mustard, soy sauce, onions, peppers, garlic, thyme, paprika, brown sugar and of course, beef. How did it go so wrong? Instead of what I expected it to be, which was soft, tender, juicy beef covered in a sticky glaze, I ended up with chewy, tasteless beef in an insipid stew. Neither of us was remotely impressed. It was a complete waste of ingredients and a totally uninspiring Sunday dinner. For me, to mess up a weekend dinner is a complete sin, food on those days needs to be fantastic especially on a Sunday when you’ve got that sinking back to work feeling and need an edible pick me up. Yet again a decent beef meal has escaped me, although seeing as I followed all the instructions in the book I would like to think that this time at least, I’m completely blameless. That’s it, I’m done with recreating holiday favourites, which is absolutely for the best as there’s no way I could ever recreate the heavenly burgers at Shake Shack or the immense crispness of the fried chicken at Pies n Thighs. Luckily a return visit to The Big Apple is on the cards so all I have to do is wait. Easier said than done though! I’m not one to make New Years Resolutions – after all, why make January even more miserable with failed promises to better yourself? – but I’d like to think that this year the least I can commit myself to is getting back in the kitchen and back to the blog. My cooking mojo recently has been somewhat lacking and the mere thought of venturing into the cold, miserably dated kitchen which we’re saving our pennies to renovate leaves me feeling less than inspired to be totally honest. But as it happens, I’m only human, and upon being asked by several friends who I’d never dreamed would find my blog remotely interesting “what’s happened to your blog?” over the last few months, my head found itself becoming rather large, and so here I am, getting back on that horse. I wouldn’t want to let my adoring public down, after all. I couldn’t start a new year of cooking without falling back on my trusty old faithful, Nigella Lawson. She’s had a terrible year and I for one am backing her all the way. I find it abhorrent that the press have gone after her as savagely as they have, while Saatchi, the man who publicly grabbed, humiliated and subsequently tried to destroy her seems to have faded into the background without a flicker of interest from the press about the ‘intimate terrorism’ he subjected his wife to. It makes me feel really uncomfortable to see people so gleeful and revelling in the fall from grace and humiliation of a successful woman who has been the victim of some form of domestic abuse, while the real criminal fades into the background. I don’t care what drugs Nigella may or may not have taken, to me she will always be my favourite food writer and a prime example of triumph through adversity. I will always buy her books. Us girls have got to stick together. Anyway, to the food. 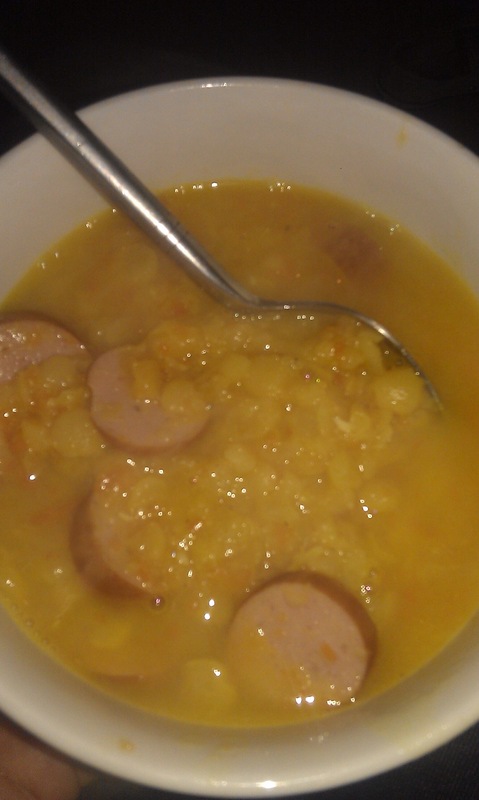 I cooked yellow split pea and frankfurter soup from Nigella’s Feast, a cookbook I don’t actually use all that often. It sounds like an odd choice of soup and not one I’d normally cook, but it’s packed full of symbolism and if you can’t cook for symbolisms sake alone on New Years Day then when can you? The yellow from the split peas symbolises gold whilst the roundness of the peas and the pound coin sized circles of sausage symbolises wealth, so the dish itself is supposed to wish you a year of happiness, wealth and prosperity. Who doesn’t wish for that on the 1st January, the warmth and tidings of Christmas now fading to a distant memory along with your pay packet and perfectly fitting skinny jeans? I’m not superstitious, but it can’t hurt now can it? The soup is simplicity itself to cook, all the fine dicing of the vegetables is done by the food processor and from there it’s a simple case of throwing everything in a saucepan for an hour until the split peas are soft. I substituted frankfurters for some smoked sausage as The Fiancé is none too keen on them, I’m sure this had no impact whatsoever on the outcome of the soup. Before eating I had some trepidation as at some points during the cooking it smelt to me -and sorry if you’re eating- like vomit and as you can see from the photo, didn’t look all that far off it either. I had some back-up tins of tomato soup in the background should it turn out to be disgusting. However, it wasn’t too bad. Comforting and warm on a cold, rainy day with a touch of spice from the mace and surprisingly filling from the peas, it’s a pretty satisfying lunch. Let’s hope it gets me that winning lottery ticket too. So, Happy New Year to you all, and thank you to those people nagging me about blogging again – it feels good to be back.